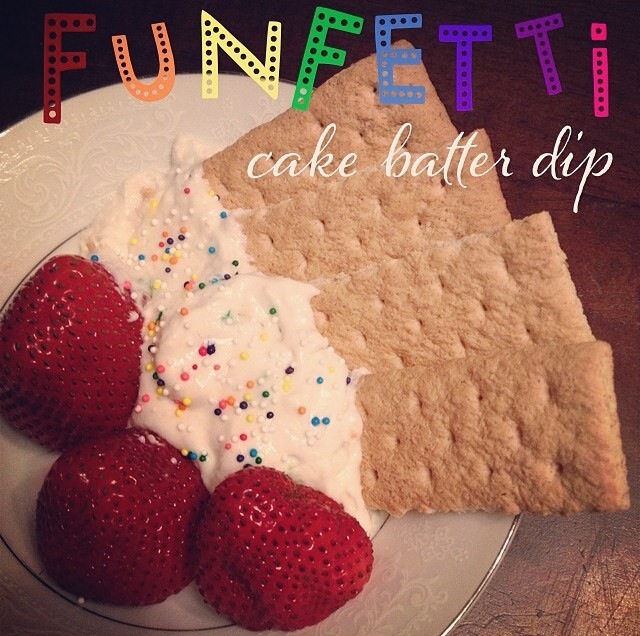 I had recently came across a yummy funfetti dip recipe here. I made it for a small get together with some friends, and quite frankly, I wanted my own; my own single serving amount. I just know if I made the regular sized batch, it wouldn’t be weight watchers friendly … at all! (since i would be licking the bowl clean in one sitting). So, I tweaked the amounts a little and came up with the perfect serving size for one! Stir and mix it up real good! Top with sprinkles 🙂 Serve with fresh fruit, graham crackers, or enjoy with a spoon. One perfectly portioned dessert in the books! Just wanted to share how much I enjoy this recipe and the brownie batter dip. It has been evening sweet tooth lifesaver since I found it. I eat it with Apple slices so it’s helping get another fruit in to boot! Thx for sharing this wonderful creation!! Aww thank you! & thank you SO much for your feedback! It’s always nice to hear how well people like the recipes. I, too, have been eating the batter dips to save my sweet tooth at night 😉 Last night I had fresh cherries dipped into the brownie batter! Another serving of fruit accounted for 😉 Again, I’m so glad you enjoy it as much as I do!